This site was occupied in several periods, originally late Bronze age between 700 - 500BC. 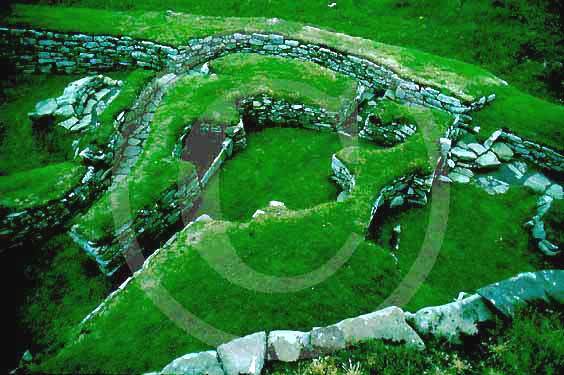 Firstly a simple farmstead which expanded to a blockhouse (fort) and then by a huge circular brock. 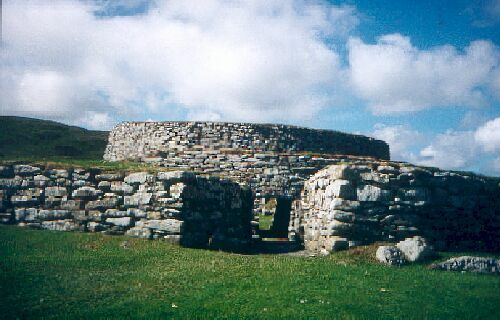 A population of around 60 lived in this little fortress. Later, 2nd century occupation is shown when a wheelhouse was added. 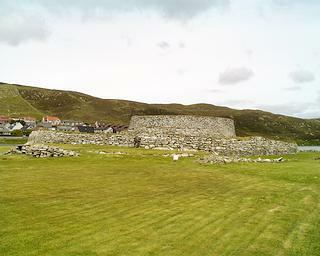 "Shetland falls outside the range covered here, but the monogragh on Clickhimin is of primary importance, not only for the details of the excavation of the small fortress, but because it sets out a convincing hypothesis as to the nature and origins of the 'vitrified' forts of the Scottish mainland." - AHA Hogg, Hill-forts of Britain.